The Book Rat: GIVEAWAY: First Impressions: A Tale of Less Pride and Prejudice, + excerpt, from Alexa Adams! GIVEAWAY: First Impressions: A Tale of Less Pride and Prejudice, + excerpt, from Alexa Adams! 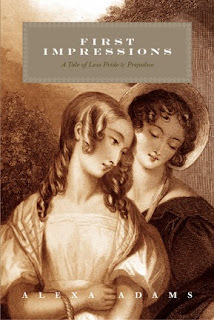 Win a copy of First Impressions: A Tale of Less Pride and Prejudice by Alexa Adams! In Pride and Prejudice, Fitzwilliam Darcy begins his relationship with Elizabeth Bennet with the words: "She is tolerable, but not handsome enough to tempt me; I am in no humour at present to give consequence to young ladies who are slighted by other men." What would have happened if Mr. Darcy had never spoken so disdainfully? First Impressions explores how the events of Jane Austen's beloved novel would have transpired if Darcy and Elizabeth had danced together at the Meryton Assembly. Jane and Bingley's relationship blossoms unimpeded, Mary makes a most fortunate match, and Lydia never sets a foot in Brighton. Austen's witty style is authentically invoked in this playful romp from Longbourn to Pemberley. “Which do you mean?” and turning around, Darcy saw a dark haired woman, of shorter stature than her sister, just perceptively tapping her foot in time to the music as she watched the dancers. She did not possess the impressive beauty of her sister, yet his quick mind was struck by the cheerful liveliness of her appearance. This lady did not pine over sitting out the set, sulking like so many women he had observed. No indeed – rather than languishing she displayed an easy pleasure in her surroundings and a generous goodwill towards those enjoying the dance. Darcy wished he could be so content, so able to relish his chosen role of spectator. He knew it to be the safest place for him. Were he to seek an introduction at this juncture it would, undoubtedly, incite unwelcome attention and gossip while forcing him to indulge in idle conversation with a young lady whose companionship surely must be intolerable. Why should he subject himself to such atrocities? A dance was entirely unthinkable. He moved to turn back round in order to give Bingley a decidedly negative response to his proposal when the lady's eyes locked on his and he realized, with a great deal of horrified mortification, that she had obviously overheard Bingley's idiotic suggestion! She gave him a knowing look – he could almost read her thoughts: “Well sir? Would you deem my company insupportable?” There was no denying the challenge implied in the raised brow: she was clearly calling him out. Was retreat possible for a man such as he? To not step forward now would be ungentlemanly, an insult to what he must admit to be an intriguing young lady – unthinkable! If there was anything certain to overcome Darcy's timidity it was the need to always uphold the dictates of etiquette. Why else would he have come to this unfortunate assembly in the first place? He was a Darcy of Pemberley after all, descendant of some of the oldest families in England, nephew to the Earl of _________. He had the honor of his name to uphold; it didn't matter if it meant attending an assembly with his host or preventing the infliction of an insult upon a lady, he would fulfill his duty. A lover of Jane Austen since her childhood, Alexa Adams' study of her work has been extensive. Residing in the Delaware Valley with her husband and two cats, she looks forward to continuing her engagement with Austen and the remarkably familiar characters she has bequeathed to this world. Visit her at http://alexaadams.blogspot.com/ to read her thoughts on all things Austen and excerpts of her work. Contest runs through June 30th. Click the pic of the cover to find out more about the book or order a copy for yourself! I have not read Pride and Prejudice, only watched the movie a few years back. I plan to read it after I'm done with the sense and sensibility.This book really intriguing.And thanks for the chance to win it! I've read it and reviewed it on my blog. It is delightful! Since I already and proudly own a copy of Alexa's First Impressions with a very special dedication to me, I just want to welcome her on Jane in June! This book looks good. Thanks for the contest. I read the review on Austinesque reviews and can't wait to read it. It sounds like a really wonderful book. I would love to enter in the giveaway!